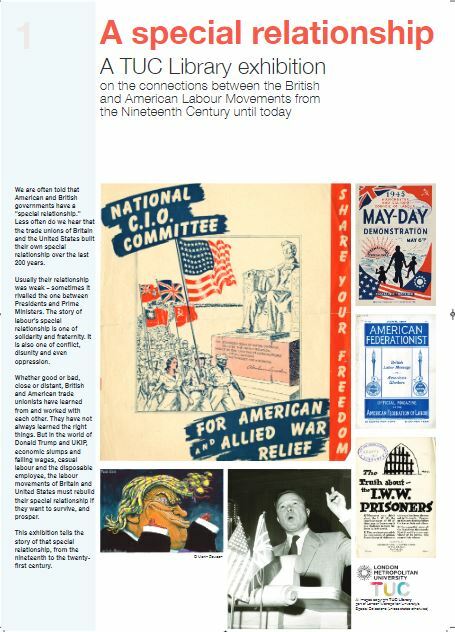 We are often told that American and British governments have a “special relationship.” Less often do we hear that the trade unions of Britain and the United States built their own special relationship over the last 200 years. Usually their relationship was weak – sometimes it rivalled the one between Presidents and Prime Ministers. The story of labour’s special relationship is one of solidarity and fraternity. It is also one of conflict,disunity and even oppression. Whether good or bad, close or distant, British and American trade unionists have learned from and worked with each other. They have not always learned the right things. But in the world of Donald Trump and UKIP, economic slumps and falling wages, casual labour and the disposable employee, the labour movements of Britain and United States must rebuild their special relationship if they want to survive, and prosper. This exhibition tells the story of that special relationship, from the nineteenth to the twenty-first century. This exhibition is available for loan. Contact Jeff Howarth j.howarth@londonmet.ac.uk for details.